WANT A FREE 30 MINUTE CONSULTATION? Smart Web Solutions is a local Central Coast business that offers professional website design and search optimisation services to help your business grow. We’ll increase your organic search to maximise your presence of the search engine pages using our tried and tested strategies. Although we offer website design services on the Central Coast, we are best known for our Content Marketing and Search Engine Optimisation services, which is how we help you grow your business. We design and build great looking websites, ecommerce online stores, but we most enjoy creating high performing websites that make our clients money. We want to get your phone ringing and filling your inbox with high quality leads that help to increase your company’s revenue. We offer a complete website design package that will help you to achieve your full online sales potential. Research tells us you have less than 2 seconds to make a good impression. With Smart Web Solutions you can make sure those impressions really count. Smart Web Solutions is a web development company that incorporates creative design as well as revenue generating, high search results. In depth keyword research and reporting to ensure we are targeting keywords that are popular, relevant to your business product or service with strong buyer intent. Our proven SEO strategies will ensure first page rankings providing your business with increased sales enquiries and improved brand awareness. Our proven strategies help small or multi-location companies to grow their business and attract more customers using Local SEO strategies. Your new e-commerce website look stunning and function superbly well but it will also get on really well with search engines too. We create, publish, and distribute valuable and relevant content for a defined target audience in order to attract, acquire and engage new customers. Our first step is to start by defining your target audience. Your target audience is a defined set of people who you are marketing your product to. What do they want and are their needs being met? We do keyword research which is a process of identifying the most popular, helpful, and buyer intent search terms used by your target audience to create engaging content that search engines and customers love. Then we identify who are your competitors by doing competitive analysis. 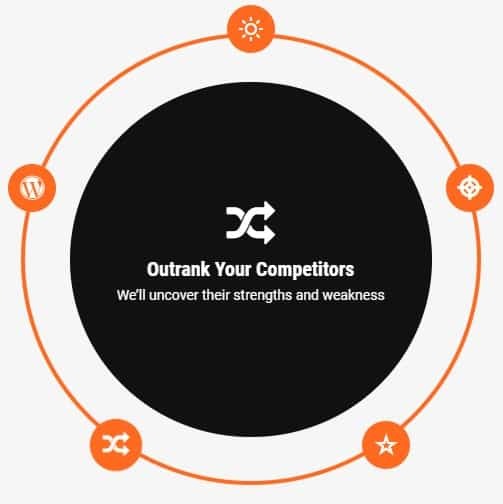 We uncover your top competitors, how they are performing, their best content and all the keywords they are ranking for. We then measure, track and report each marketing initiative via Google & Industry tool-sets to monitor the performance and ranking improvements of target search terms. WANT A FREE 30 MINUTE SITE REVIEW? Our large and deeply valued client base here Sydney, Central Coast and Newcastle area really appreciates the vastly improved performance in their online store sales and presence, the site functionality and mobile-friendly ease of use, not to mention the search engine ranking improvements.